In many households, Easter celebrations include an Easter egg hunt and baskets filled with chocolate bunnies... but each year hundreds of cats become seriously ill as a result of their family's festivities. 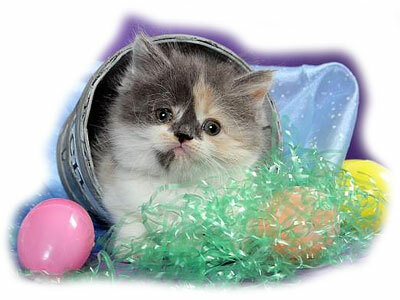 Here are some tips to keep your feline safe by being aware of the common dangers that Easter traditions can pose. For many people, the beautiful trumpet-shaped white Easter Lily symbolizes purity, innocence and hope -- the spiritual essence of Easter. But — lilies are toxic to cats. 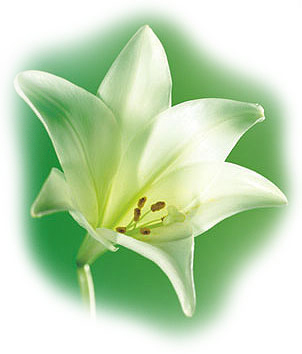 This includes not only the lovely Easter Lily, but many species of lilies including the day lily and the tiger lily. Their leaves contain toxins that can cause severe kidney damage in cats. If your cat eats just one leaf of a lily, it can result in severe poisoning. Within minutes to several hours after ingestion, your cat may stop eating and begin vomiting. As the toxins begin to affect the kidneys, the cat may become lethargic, and within five days, kidney failure can cause death. If you suspect your cat has eaten part of a lily plant, it is important that you contact your veterinarian immediately. If treatment is started early, chances for recovery are good, but once the kidneys have been severely affected, your cat may not survive. For more information, read the article titled Lethal Lilies. If you must have lilies at Easter, keep the plants in a separate room where your cat is not allowed to enter, but the safest way is to not have any lilies in your home ever. Of course, cat owners do not have to do without any floral decor at Easter. Instead of lilies, consider enjoying an Easter orchid, Easter cactus, Easter daisies or violets. Then you can enjoy a happy AND cat-safe Easter. 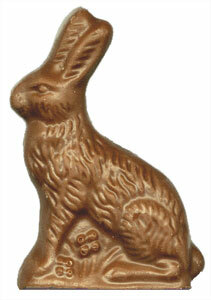 Chocolate is another Easter tradition. Yummy! But, once again, it is important to know that chocolate is toxic to both cats and dogs. Chocolate contains caffeine and theobromine, which stimulate the nervous system and can be toxic when taken in large amounts. Baking Chocolate: This type of chocolate has the highest concentration of caffeine and theobromine and very little needs to be ingested before signs of illness become apparent in your cat. Mild signs of toxicity can occur when 0.1 ounce per pound of body weight is ingested. Severe signs occur when 0.3 ounce per pound of body weight is ingested. That means that as little as one small one-ounce square of baking chocolate can be toxic to a 10-pound cat. Semi-Sweet Chocolate. Mild signs of toxicity can occur when 1/3 ounce per pound of body weight is ingested. Severe signs occur when 1 ounce per pound of body weight is ingested. This means that as little as 3 ounces of semi-sweet chocolate can be toxic to the nervous system of a a 10-pound cat. Milk Chocolate. Mild signs of toxicity can occur when 0.7 ounces per pound of body weight is ingested. Severe signs occur when 2 ounces per pound of body weight is ingested. This means that a 10-pound cat would need to ingest 1/2 pound. White Chocolate. Mild signs of toxicity can occur when 45 ounces per pound of body weight is ingested. Severe toxicity occurs when 90 ounces per pound of body weight in ingested. This means that a 10-pound cat would need to ingest 27 pounds. These high amounts mean that theobromine toxicity from white chocolate is highly unlikely. The high fat content in chocolate can also cause vomiting and diarrhea. Make sure that chocolate is kept in a safe place. If you suspect your cat has eaten chocolate, consult your veterinarian immediately. Animals treated for chocolate toxicity generally recover and return to normal within 24 to 48 hours. Take care to keep Easter baskets away from your cat. Like children, cats love to nibble on goodies in the Easter basket. Unfortunately, a curious kitten might also enjoy everything in the basket, even the colorful plastic grass, toys and foil-wrappers on candies. Cats love string-like objects and often play with the grass before eating it. The plastic in Easter grass is non-digestible and can become tangled in the intestines, leading to blockage and possible perforation. If ingested, small plastic toys can cause choking or become lodged in the stomach or intestines and also create an obstruction. Ribbons, bows, streamers and other decorative items can result in choking or strangulation. Keep these items away from your cat and throw candy wrappers in a covered trash can. If you suspect that your cat has eaten something that may not pass through his intestinal tract, contact your veterinarian. Also, if you notice a sudden loss of appetite, vomiting, excessive drooling or abnormal bowel movements, consult with your veterinarian immediately.